Reporting for Journalists explains the key skills needed by the twenty-first century news reporter. 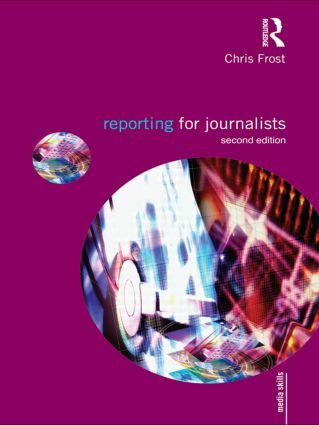 From the process of finding a story and tracing sources, to interviewing contacts, gathering information and filing the finished report, it is an essential handbook for students of journalism and a useful guide for working professionals. an annotated guide to further reading, a glossary of key terms and a list of journalism websites and organisations. Chris Frost is Head of Journalism at Liverpool John Moore's University, UK. A journalist and a teacher for almost forty years, he chairs the National Union of Journalist's ethics council and is a member of the NUJ Professional Training Committee. He is the author of Journalism Ethics and Regulation (2007), Media Ethics and Self Regulation (2000) and Designing for Newspapers and Magazines (2003). The Media Skills series provides concise and thorough introductions to a rapidly changing media landscape. Each book is written by media and journalism lecturers or experienced professionals and is a key resource for a particular industry. Offering helpful advice and information and using practical examples from print, broadcast and digital media, as well as discussing ethical and regulatory issues, Media Skills books are essential guides for students and media professionals.